Media Validator is a sophisticated solution for both manual and automated media content quality validation and assessment. No special media content knowledge is required to operate the solution. The Media Validator provides fast and reliable way to evaluate the encoding and multiplex quality of your media content. It allows real-time and fast media processing in easy-to-learn and operate intuitive user interface. Integration with third-party systems is available through API. Media Validator offers digital media content instant validation of DV, DV CPro 25/50/100 (DV HD), MPEG-1, MPEG-2, MPEG-4, AVC/H.264, HEVC/H.265, XDCAM, XDCAM IMX, XDCAM HD, XDCAM EX, XAVC, MJPEG, JPEG2000, WMV, VC-1, VC-3, DivX, Raw Video, MPEG Audio Layer 1/2/3, AAC, AMR, WMA, AC-3, Raw Audio, AVI, MP4, ASF, 3GP, MOV (QuickTime), MXF, MKV, MPEG-2 Program Stream, MPEG-2 Transport Stream, VOB, HDV, AVC-Intra, BMP, PNG, TGA, GIF, TIFF, JPEG, XML and more. See the full specification here. Manual batch validation and watch-folder automated validation makes it easy to improve the quality of your digital media services. The product supports different digital media validation modules, through its plug-in system. See the listed validation modules to the right. How the Automatic Media Validation works? Simply setup your watch folder with your media files in it. The solution monitors the watch folder. Whenever new files are added there, the Media Validator automatically performs validation and analysis of the files. A log report is created for each validated file. 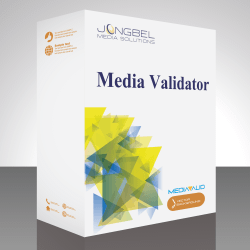 Not sure how Media Validator will work for you? Batch validation for manual media validation. Watch folder validation for automated system validation. Report file export to XML. External and remote IP control through powerful API. Third party systems integration through powerful API. Single-pass and multi-pass media validation. Validation report review during the validation process. Media Validator Server is 1U rack mountable hardware solution for file-based media analysis and validation. The server has 1 TB internal storage, for on-server media files validation and two 1 Gigabit Ethernet LAN ports for remote file access and validation. For remote monitoring and operation it has IPMI with dedicated LAN port.